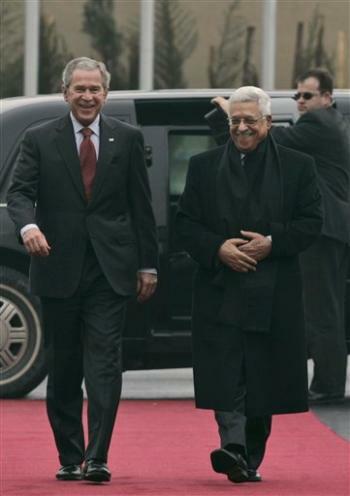 U.S. President George W. Bush, left, is seen walking with Palestinian President Mahmoud Abbas upon his arrival in the presidential headquarters in the West Bank city of Ramallah, Thursday, Jan. 10, 2008. President Bush arrived at Palestinian President Mahmoud Abbas' headquarters for his first-ever visit to the Palestinian territories. Bush misunderestimates the power of words. According to the Associated Press , President George W. Bush recently "called for the end of the 'occupation' of Arab land by the Israeli military." I think Bush’s adoption of the word "occupation" represents a typical misunderstanding of the words he speaks and the power they represent. That Bush used the phrase "occupation of Arab land" is even more significant, because it presumes a boundary which has yet to be mutually recognized, which designates internationally recognized "Israeli land" which Islamic states besides Egypt and Jordan will accept. The international language of United Nations resolutions 242 and 338 also use this language. It presumes that "occupation" only began in 1967, a result of Israel’s reply to the massing of troops at Israel’s borders, and the preparation of nearby airfields for fighter and bomber attacks. It makes no mention of the 19 year Arab occupation of the Jewish Quarter in East Jerusalem, nor of the deep incursions of Arab troops into the 1947 partition during the War of Annihilation against Israel in 1948. It is remarkable that so few comments have protested the explicit language of President Bush, when so many protested the leaked proposals that President Clinton made in 2000. It is remarkable how similar Bush’s remarks are to the widely protested remarks of Secretary of State James Baker, many years ago. This uncritical reception for a so diplomatically challenged Republican president is a disturbing comment on the bias of many in our Jewish establishment. All populated land is by definition "occupied." The sophistry of speaking only of Israeli occupied land is both unequal and unrealistic. The sophistry of refusing to speak of Israeli national land is the result of a similar double standard, which only Israel is forced to bear.